Now, aside from the fact that they missed a huge opportunity to create "Srirachos," this is a pretty huge development in Taco Bell's partnerships with other brands. Move over, Fire Sauce! 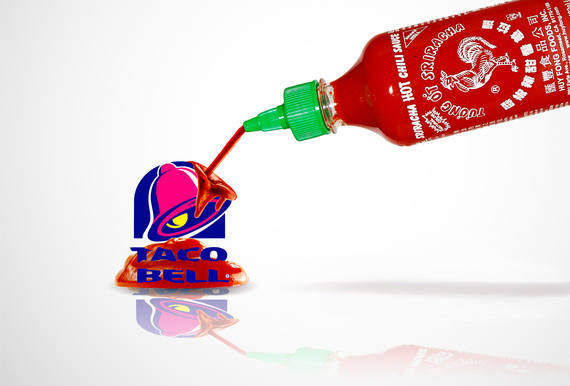 Taco Bell is reportedly testing a new Sriracha menu at locations around the Kansas City area, which features a variety of items filled and topped with America's favorite hot sauce. Interested parties can try: the Sriracha Nachos Supreme, the Sriracha Quesarito, the breakfast Sriracha Scrambler Burrito (with eggs, potatoes, nacho cheese, Sriracha, and pico de gallo), the Sriracha Loaded Griller, and the Sriracha Taco. You can also get any of their other menu items topped with Sriracha upon request, so the possibilities are limitless, Bradley Cooper. Now, aside from the fact that they missed a huge opportunity to create "Srirachos," this is a pretty huge development in Taco Bell's partnerships with other brands. But will they start integrating rooster sauce into the recipes of more and more of their dishes? Personally, we can't wait to find out. Or until this is rolled out nationwide. PLEASE, T-BELL, PLEASE.